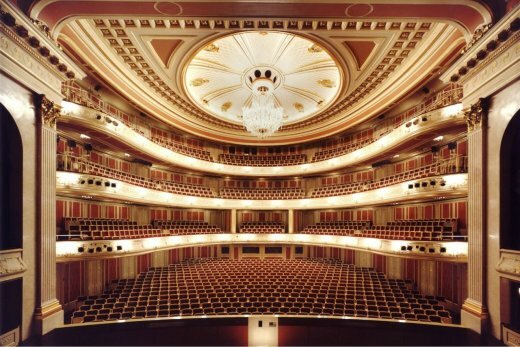 Daniel Barenboim started the Easter Festtage with the Berlin Staatsoper in 2006. The Staatsoper on Unter den Linden reopened recently after a prolonged renovation and we attend the first performance in the restored house of Andrea Moses’ acclaimed 2015 production of Die Meistersinger von Nürnberg and a new production of Prokofiev’s “lyrical comic opera” Betrothal in a Monastery, based on Sheridan’s play The Duenna. Barenboim and the Staatskapelle are joined by the soprano Anna Netrebko and the Rundfunkchor in a spectacular Verdi concert at the iconic Philharmonie. At the Deutsche Oper in West Berlin we have Wagner’s first and last major operas : Rienzi in a classic production and Parsifal conducted by Donald Runnicles, their music director. And to complete our attendance at all the main Berlin opera houses we have tickets at Barrie Kosky’s Komische Oper for the legendary Harry Kupfer’s new production of Handel’s 1731 London hit Poro, re dell’Indie to a libretto by Metastasio about Alexander’s invasion. We have rooms at our favourite Berlin hotel, within easy walking distance of the Staatsoper, and walks and talks by our favourite guide, Tom Abbott. Cost : £2240 includes return scheduled BA flights, transfers, 6 nights bed and buffet breakfast in twin-bedded room with private facilities at the 4* Hotel Albrechtshof, good tickets for all operas and concert. One dinner and 4 opera interval refreshments. Single supplement £190. Deposit £400 pp. Without flights £2090.